Helvetica typefaces in OpenType format may be purchased at the websites listed. Single fonts cost about $26 each. Font family packages start at about $150 and go up depending on the number of weights, styles, and features included. You can also download free Helvetica fonts. When choosing a Helvetica font family package, consider your design needs. OpenType Pro fonts support central and eastern European languages, such as Turkish and Polish, by adding a full range of accented characters. Some Pro fonts (though not all) also contain Cyrillic and Greek character extensions. Because there is feature variation from Standard to Pro font versions, read carefully to be sure the font package you purchase offers the features you want to use. OpenType is a cross-platform format that eliminates text reflow, character substitution, and kerning elimination issues associated with sharing documents between Mac and PC systems. Adobe and Microsoft worked together to develop this powerful format for digital typography. The design stability of OpenType might be enough to justify investing in an updated type library, but the new format offers more. Its expanded character set provides foreign language support and advanced typography options. If you translate documents, using OpenType allows you to maintain typestyle consistency in nearly all the world’s languages, including special punctuation and currency symbols. Each OpenType font contains as many as 65,000 character shapes, or glyphs, including old-style figures, true small capitals, fractions, swashes, superiors, inferiors, titling letters, contextual and stylistic alternates, and a full range of ligatures. Most postscript fonts were limited to 256 glyphs. To use swash characters, for example, a second font of alternates was required. Using Adobe CS3 or newer software allows easy access to OpenType typography features through pull-down menu selections and automatic settings. OpenType is a registered trademark of Microsoft Corporation. Helvetica is arguably the most used sans serif typeface in the world. It has been an anchor, used in headlines, text, signage, and forms. Plain and readable, with a variety of weights and widths, the Helvetica type family has endured as typesetting advanced through hot lead, photographic, and digital systems. Type designer Max Miedinger created the style for Haas Type Foundry of Switzerland in 1957. 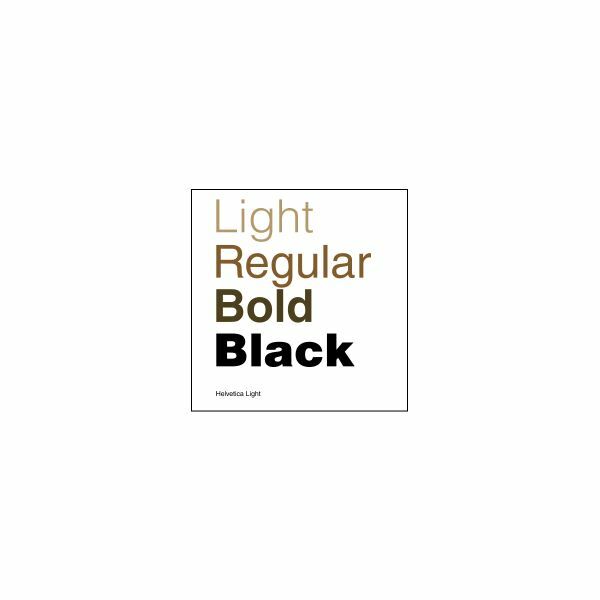 He called the typeface “Neue Haas Grotesk," but it was changed to “Helvetica" only a few years later as it became an icon for Swiss (“Helvetia" in Latin) type design. Other typefaces Miedinger designed include Akzidenz-Grotesk, Miedinger, Monospace, and Swiss. Linotype re-designed and digitized the “Neue Helvetica" type family in 1983. And in the early 2000s Linotype introduce the digital “Helvetica World" type family, which supports multi-national writing systems. Helvetica OpenType is available in your choice of Standard, Neue, and World versions.